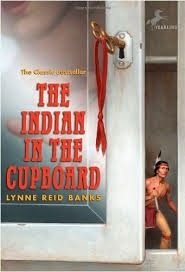 The Indian in the Cupboard is about a boy named Omri. On his birthday his friend Patrick gives him an Indian toy and his brother gives him a cupboard to keep the toy. Omri uses a magical key, which belonged to his great-grandmother, to bring the toy to life with the cupboard. When Omri discovers the Indian is alive his life is filled with adventures beyond anything he thought possible. Omri shows his friend Patrick that the Indian is alive. The next day Patrick goes to a comic book and action figure store and buys a toy cowboy with a gun in its pocket. Then he goes to Omri’s house the next day to put it in the cupboard to make the cowboy real. While Omri is getting some soup for the Indian, Patrick puts the cowboy into the cupboard and he makes the cowboy real. Right after the cowboy comes to life Patrick goes home without the cowboy so Omri brings the cowboy and Indian to school the next day. The story gets really interesting after that. Omri learns that is it hard to take care of a person that small. He has to feed the Indian and provide a home for him. I think The Indian in the Cupboard is a good book. The idea was also interesting about a magical cupboard that could bring things to life. As I read the book though about what I would do if I had a magical cupboard like the one Omri has. This book makes me wish that magic was real. I recommend this book for people who like good surprises because the book gets more exciting as I read it. I loved finding out what was going to happen and if Omri or his friend Patrick would get in trouble. I can’t wait to see the movie.